This is one of my favorite “holiday” outfits. 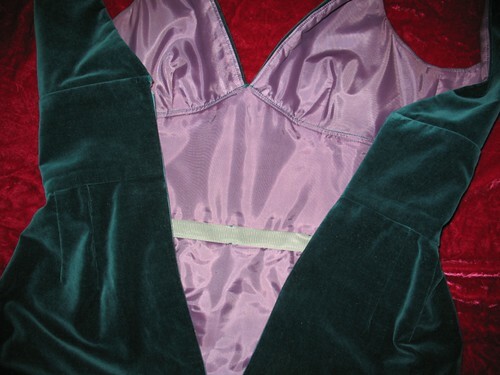 Since the winter holidays are over, and the acceptable time for wearing velveteen will soon be at an end, I decided to pull the dress and jacket out of the closet. One of my favorite things about the dress is the lining. Teal and purple is probably my favorite color combination. And while the purple is not visible to others, knowing it is there makes me happy! 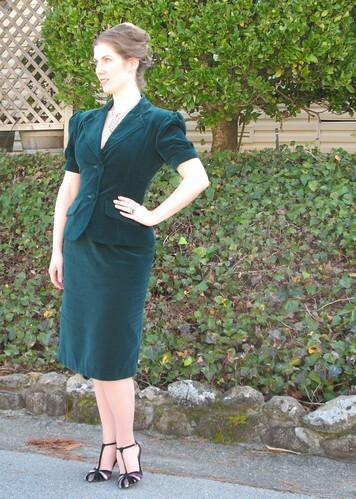 Neither the jacket nor the dress is a vintage pattern, but it still manages to have a very old-fashioned vibe. I cannot decide if this is the fault of my styling, or I picked the patterns because of the vintage style lines – probably a bit of both! 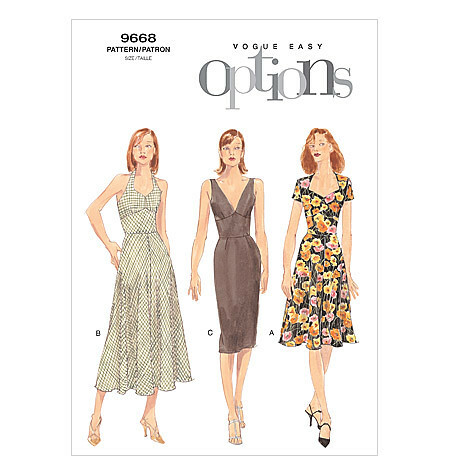 Here is the dress pattern. See – it really is a contemporary pattern. As is the jacket. Oh well, I guess this is further proof that I am still stuck in the past . . . things could be a lot worse! 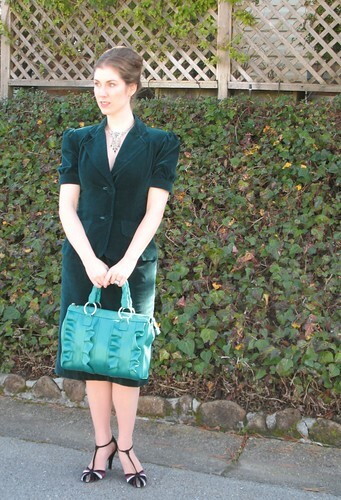 Purse: Harveys Seatbelt Bag "Lola"
I love this! 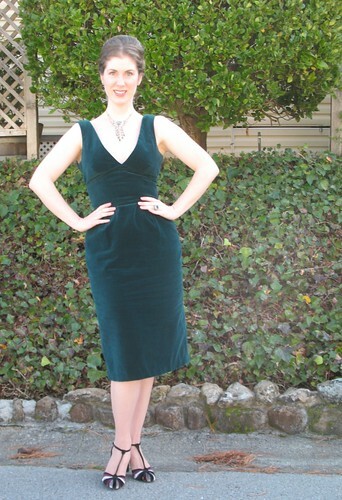 I tend to do this with modern patterns too :) The velveteen is such a lovely colour! Well done!! Lovely, like all your creations. This is a wonderful outfit. Love the colour combination. You do "know" your style so well that even contemporary patterns have that smart vintage look. ...there ought to be a law! Utterly lovely! :) I just adore the green color--it looks smashing on you! I too find that often my love of vintage silhouettes will lead me to inadvertently selecting modern patterns that have a bit of a vintage flair to them (or at least when I'm done with them it does! lol.). hehe! Just can't get away from it, I guess! It's a great outfit! And you look wonderful in green! I really love it! 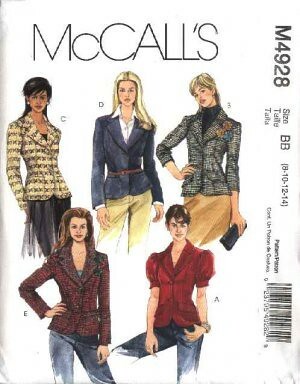 The jackets puffy sleeves are my favourite I think and the lining looks great. I think the reinterpretation of a pattern is what it's all about. I love looking at Burda Magazine stylings for a particular pattern but I would never, never try and replicate the exact look. as always your work is incredible! Oh! You have me rethinking how to mix and match my patterns! I love this combo! Thanks for sharing this! I love the dress! It turns out I have the pattern - I never knew it could look so stunning! Very, very lovely - and I too love teal and purple together!